About a week ago, lovely Emily over at La Dolce Vita came up with In The Pink, a food blogging theme of making something pink for breast cancer awareness. It’s such a wonderful idea which I am very happy to take part in by producing a culinary version of the pink ribbon. I was supposed to be posting this between 7th – 9th October but I took a head start since I won’t be here then. For more details, head over Emily’s site – there is more than a week before the event, so make something pink and have fun! The shape of these might be familiar by now, and yes, it is another recipe from the Hidemi Sugino book. There are actually quite a lot of pink/red recipes in the book – but I thought this one was the prettiest :) It’s basically a raspberry mousse with almond sponge. I made raspberry jam for the stripy pattern on the sponge – pipe the jam diagonally onto the batter before you bake it, then after baking cut into thin strips and fit around the bottom of the moulds as well as the base. It’s got raspberry sauce inside the mousse, the recipe suggested using redcurrants as well as raspberries but I couldn’t find them anywhere (the season’s over!) and so had to manage just with raspberries. Although I could tell that it would have had more flavour and contrast if I had added redcurrants too, it still tasted good (and looked pretty). Anyway, we’re off to the south of France and Northern Spain (by motorbike! ), so hopefully I can take some yummy photos there. I’m sorry I’m always late getting back to your comments and messages, but I’ll try to write back when I return. See you in a couple of weeks! I was always a tomboy too (maybe that’s why I ended up being a nature-loving marine biologist who always ends up dirty), and I still won’t wear it (minus those cute little pink ribbons), but I do like pink food and I think this is a beautiful way of supporting breast cancer research. The presentation is beautiful. Have a fantastic trip and I look forward to your return! It’s so adorable! All that came to mind was "Kawaiii!" I hope that you have a wonderful time in France/Spain. i don’t suppose tho hidemo sugino person has a version of the cookbook translated into english?! but this photo really fascinates me!! Wow, you go to France & Spain? I envy you! Hi Keiko -- another lovely creation for a terrific cause. Have a great vacation! Have a great trip, I can’t wait to see you (and all your gorgeous entries) back on the blogging scene when you return. It’s autumn over there now? Lovely season for motorbike trip. I’m sure you have great time! While I know this a food blog, but if you have a writeup on your motorbike trip, would love to read about it as well. Thanks! Hi Keiko- Oh my God! 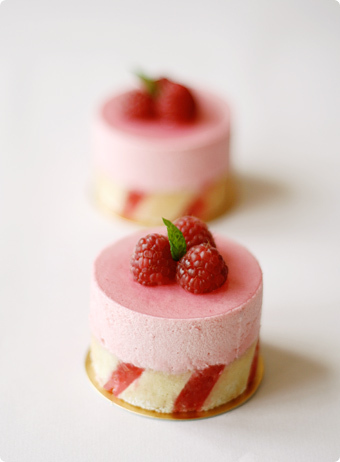 This is the best raspberry mousse cake I have ever seen. I was able to see tons and tons of raspberry mousse cake in different books and cake shops but yours simply looked the best among them. Most of the design I saw were way to complex making it loose its appeal. Yours is simple but at the same time very neat, cute, adorable as well as very pleasant to the eyes and taste buds. I love raspberry mousse but I haven’t tried them with red currants, I think it will taste really good, I also like raspberry with chocolate, pistachio or vanilla. Thanks and have a nice trip. We are not worthy! Words cannot describe how perfect that looks. Can’t wait to see you photos from the Sud! I like France and Spain, beautiful countries. Hope you’ll post something about your trip and your culinary adventures over there. that looks absolutely yummy and it’s a very good cause that you’re trying to raise awareness to! So beautiful Keiko ! I also make that sort of cake (but not individual size) and I’m amazed by your culinary skills ! It toook me a long time to make a regular coating. Do you also make the "biscuit joconde" yourself ? (sorry I don’t know the word in english, i mean the decorated sponge cake which circle your little cake) ? I’ll miss your posts while you’re gone! But your trip sounds totally fantastic - I’m sure you’ll have some good stories and pictures! Have a great (safe!) time! Hence, I love this entry, and all your work as usual, Keiko. Have a lovely time on your trip. I just returned from a trip to Paris - and your creation looks every bit as good as all the pastries I saw there! I’m very impressed - have you been baking a long time? Because even a year ago I would have never dreamed of doing something like this in my own kitchen! this is so pretty and perfect!! What an awesome job! I love your site, i shall check back again more regularly. That looks awesome Keiko YUM! These are the gratest "Pink Ribbon" that I’ve ever seen! I’m very glad to see this photo. It has full of happiness. I know that this event holds an ad contest now. I prefer this picture!! Thank you keiko-san, to make these cakes for the pink ribbon event. Hope you are enjoying your holiday. I went to Provence last month to cling on to the summer sun and most importantly immerse myself in the colours I adore. (Ever since, I cannot stop painting furniture!) My husband and I went to Bistrot d’Evgalieres "Chez Bru" to cerebrate our marriage anniversary. Its "chef’s surprise menu" was enjoyable and delicious. 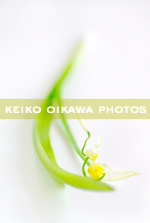 Hello Keiko, I love your site and especially your photos. Would you mind telling me what sort of camera you use? I could stare at your photos all day! Yum! That is gorgeous Keiko. Pink is my favourite colour. After years of wearing black in winter and white in summer I’ve started to wear pink. Yummy! Makes me want to reach out for some pink food now. Enjoy yourselves. i just want to say that i absolutely adore your pictures and the way you present your marvellous dishes! How beautiful! Somehow I hated pink as a kid too, but love it as an adult. Hi Keiko, it looks beautiful. What a lovely way to show your support. I hope you have a wonderful trip! Sweet shot. It’s beautiful like a baby toy ! Very nice colors. Hi there, thanks so much for all your kind words, we had a lovely holiday even though it was hard work riding so long! Michelle - I guess I’m still a bit of a tomboy, but I like pink too ;) I’m fascinated by what you do, by the way! J - I don’t think there is an English version I’m afraid. Emily - I’m really happy that so many people participated in the event, thanks again for your hard work! Cathy - you are always so kind - it looks pretty, but tastewise I’ll probably need to improve the recipe next time! Fred - yes, I make biscuit joconde too, I like that bit as it’s the quickest and easiest part of the whole process! Anita - I think I always liked baking, but before I started this blog, I hardly tried complicated desserts. Your creations always look gorgeous! Lola - I just got a Canon 350D and am slowly getting used to it. This is so pretty! I have a question i hope you don’t mind, i’ve always admired your beautiful creations and am just wondering, is Hidemi Sugino book in english or japanese? And would you please recommend me a book (i’m currently searching on Amazon) for my ’sweets’ and ’cakes’ adventures (yours are always so pretty and looking so tasty). Wonderful cake in the lovely pink color. It looks very fresh and delicious. The strawberry fits it well. I admire your patience and carefulness. Hi Keiko, Is it possible for you to show us how you created this step by step with pictures? It’s the most amazing dessert I’ve ever seen in my life. In fact it’s not food, it’s ART! I love the shiny pink top layer on top of the mousse. If nothing else, can you please give me instructions on how to do the very top layer? I’m guessing it’s gelatin but would like instructions before I try something like this. Thank you! I’ve been searching high & low for an English version of Hidemi Sugino’s dessert book. Do you have any idea where I can obtain one? Su – he has two books and one of them called Dessert Book has a ‘brief’ English translation. You can buy it from Amazon Japan, just click ‘Would you like to see this page in English?’ on the page and you should be able to order in English from there. I ran across your site and I am stunned, speechless, but enormously inspired. I was trying to order the cook book of Hidemi Sugino via Amazon which you had suggested and unfortunately I couldn’t find the English phrase “Would you like to see page in English”. Could you please tell me where that sentence is hidden.May be it’s written in Japanese, but I can’t read Japanese. WOW! it looks so good! MmmMm… i would love to try it out^O^ i would say too, that it look professionally made. ^^ not just that but it’s kind of similar to what i design, but without the strips and colors, still it’s amazing!!! Could I have the recipe for the pink mousse layer? I must defintely bake this for christmas this year…. I am tyring out a similar taro mousse cake this weekend.Hopefully I san produce beautiful layer like yours…. Gaiza – you see the English sentence right above the ‘add to shopping cart’ button on the right. Hope you can find it! Ashley – you can find quite a few raspberry mousse recipes if you search on google, it’s the same as any other basic fruit mousse, containing fruit puree, gelatine and double cream (I’ve added Italian meringue instead of sugar). Hiya! i stumbled across your site a couple of weeks ago and its just incredible!! i love all the wonderful desserts and the pictures. i was wondering if u could give me a couple of pointers. i love how the cake bit is striped. last week i baked a green sponge cake, and all the edges were brown(ie the top, bottom and sides were all brown). but when i cut into it, it was green. will the same thing happen if i did the stripy jam bit on the sponge? Hi Div – thank you for your kind note and I’m sorry it took so long to get back to you. I’m assuming you mean matcha sponge cake, and if it is, yes it gets slightly brown when you bake. I don’t think putting jam on the sponge makes the colour change.